Let's here it for the home state! When Kathleen McGinty, Secretary of the Pennsylvania Department of Environmental Protection, told to me a few weeks ago that Pennsylvania was "actually now leading the country in manufacturing renewable energy technology, housing the world's leading companies in renewables," I remained skeptical, if hopeful. Secretary McGinty backed up her statement by listing the companies: Gamesa, Iberdrola, Conergy, AE Polysilicon, Solar Power Industries, Axion, and Bionol, among others, have all become PA companies and major investors in the Commonwealth in the last 3 years. "We are first in the country now in growth in manufacturing and first in job creation in venture-backed enterprises," Katie said. But, she added, there was a still a long way to go. 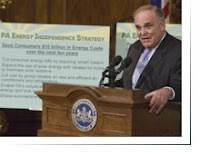 Key, she thought, was Governor Ed Rendell's Energy Independence Strategy (EIS) to spur further growth and development in the Commonwealth. Now, Pennsylvania is making a $665.9 million investment to spur the development of alternative and renewable energy technologies and help customers and small businesses take steps to reduce their electricity consumption and save money. Together the Alternative Energy Investment Fund and the Alternative Fuels Investment Fund will target $237.5 million specifically toward helping consumers conserve electricity and manage higher energy prices, and $428.4 million to spur the development of alternative energy resources and create good-paying, skilled jobs for Pennsylvania’s hard-working men and women. * $25 million for pollution control technology to help energy generators meet state and federal standards. Under the alternative fuels law, every gallon of gasoline and diesel fuel sold in Pennsylvania must contain a percentage of biofuels, ramping up to 20 percent biodiesel and 10 percent ethanol once in-state production reaches certain levels. "This new investment fund will strategically target new resources to leverage as much as $3.5 billion in private investment and create at least 13,000 new, good-paying jobs in an industry that is sure to be to the 21st century what information technology and biosciences were to the later 20th century," the Governor said in a press statement. Makes me proud to say I live in Pennsylvania, the State of Independence and perhaps the new green economy. Congratulations, Governor Rendell and Secretary McGinty -- and all Pennsylvanians. Energy: On the Way to $200 Oil?